Gazpacho is the signature summer soup for those hot beach days. 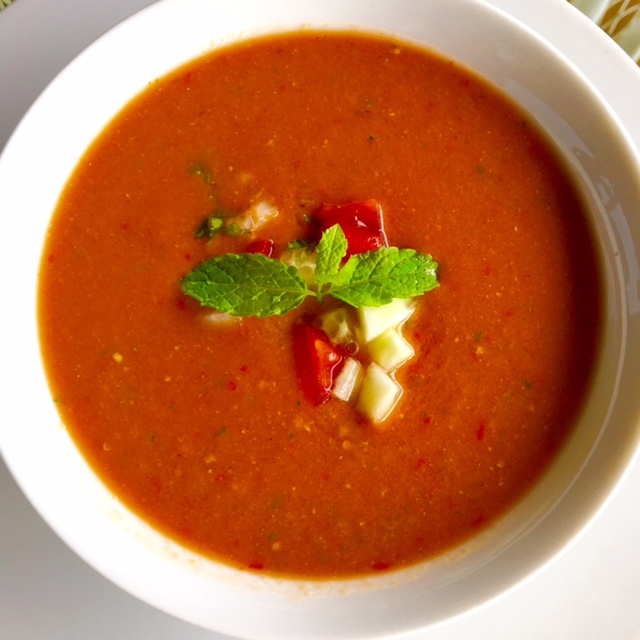 There are many recipes to make a good Gazpacho; the following is my favorite because it is easy and light! You mash all of the above ingredients, add salt and vinegar to your taste and olive oil to reach the consistency you like. It is supposed to be like a soup, quite liquid. Keep it in the fridge until served. On the side, as a topping you have various choice such as chopped tomatoes, cucumber, onion and bread. Add these toppings to your Gazpacho when served and a bit of mint for colour.